Construction Location : PT PAL Indonesia’s Shop. Project Duration : 19 (Nineteenth) Months, February 2008 – September 2009. Contract Value : above 19 Million USD. 1. Pressure Vessels & Tanks. 6. Dew Point Refrigeration Package. 11. Dew Point Chiller Package. 1. Front End Engineering Design Evaluation, optimization and verification. 4. Pressure Vessel, Piping and Structure Fabrication. 5. Static Mechanical Equipment Fabrication and Installation. 6. Piping, Electrical & Instrumentation, Control & System Installation. 7. Civil works for Plant Construction. 8. Tie-in with PT Indonesia Power Gas Receiving Mater. 9. Tie-in with Offshore Pipeline for Oyong Phase 2 Contractors. Contract Value : above 4 Million USD. Brief Description : Monopod Platform. 1. Engineering Evaluation and verification. 3. Procurement Services for Steel Structure Raw Material, Piping & Instrumentation, Electrical and Bulk Material. 4. Platform Steel Structure Fabrication. 5. Pile & Jacket Steel Structure Fabrication. 6. Mechanical Equipment Fabrication and Installation. 7. Piping, Electrical & Instrumentation Installation. 8. Pre-Commissioning, Load Out and Sea Fastening. Construction Location : PT PAL Indonesia Shop. Contract Value : above 60 Million USD. 2. Procurement Services for Equipment, Steel, Super Duplex Material, Electrical, Instrumentation and Bulk Material. 4. Fabrication Pile & Jacket and Platform Steel Structure. 6. Fabrication and Installation Subsea Pipeline 18” (42 km). 7. Dew Point Control System. 3. Platform Steel Structure Fabrication. 4. Pile & Jacket Steel Structure Fabrication. 6. Piping & Instrumentation Installation. 7. Pre-commissioning, Load Out and Sea Fastening. Equipment : Turbo Compressor Module Package. Phase XI Oct 2006 – Febr. 2008. Phase XI above 38 Million USD. 4. Electric and Control System. 1. Basic and Detail Engineering. 8. Load Out and Transportation. 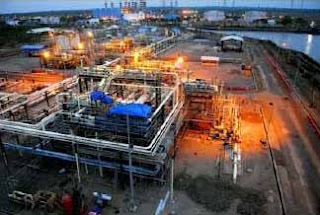 Equipment : Compressoion Modules Train C and D.
Project Scope : Engineering, Procurement, and Construction. 5. Piping & Instrumentation Installation. 7. Load Out and Transportation. Equipment : Monopod Platform and Pipespool. Quantity : ea 1 (one) Unit. Project Scope : Procurement and Construction. 5. Load Out and Transportation. Quantity : 1 (one) Set. Equipment : Glycol Regeneration Package. Quantity : 2 (two) Units. Contract Value : above 1,500,000 Million USD Approx. 4. Fabrication, Machining and Construction. Project Scope : Engineering, and Construction. Contract Value : above USD 500,000. Equipment : Oil Mooring Barge. Project Scope : Repair and Maintenance.